At holiday time or any time, this is a delightful gift to give and receive. 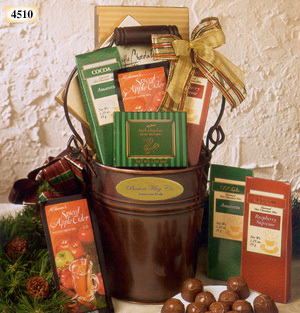 The bronze-look pail is filled with flavored cocoas, spiced apple cider, and luscious homemade chocolates, including our famous Double Chocolate Truffles. Imprint your logo or message on the attractive gold foil label. Shipping weight: 4 lbs. Measures 7” diameter x 15 5/8” high. Case pack: 4. Prices shown per piece. Prices shown per piece. 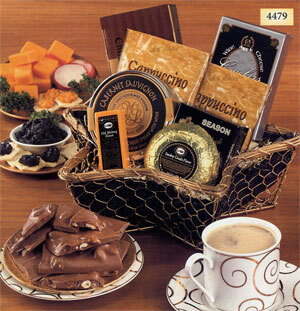 This star-shaped gold wire basket is perfect for reward or recognition. Everyone will be a “Star” when they receive these epicurean delicacies-chocolate almond bark, Cabernet Sauvignon cheese spread, gold-foil gouda, cappuccino, caviar, and caviar crackers. Shipping weight: 3 lbs. Measures 11 3/8” x 9 ½” x 8 ½”. Case pack: 4.Prices shown per piece. 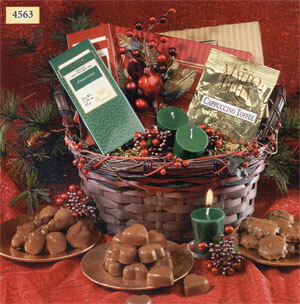 This holiday basket is full of treats including chocolates, cocoa, toffee, and candles with a glass holder. Shipping weight: 3 lbs. Measures 12 ¼” x 9” x 9 ¾”. Case pack: 4. Prices shown per piece. ♦ FAST SHIP SERVICE available on this item. See Fast Ship Service for details and ordering information.